Back in high school I served as a peer mediator and while a majority of the issues we dealt with were pretty typical of the setting, once we received a case involving perceived difference of religion which snowballed so spectacularly - including off campus vandalism and violence with others in the community - that during the entire session, we had police on standby right outside the door. Thankfully nobody was injured but it taught me an early real-world lesson that insults involving religion could escalate with such severity and speed, not just in our history books or on the evening news but even in the suburbs of Minnesota. But if you transfer the conflict to the Middle East where there's been so much pain, suffering, and unrest involving all religions throughout the region's history, the potential for chaos is magnified to the extent that it wouldn't take more than a mere spark to erupt a volcano with the potential to envelop everyone in its path. 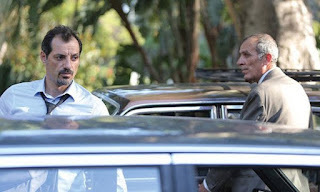 And with the action set in contemporary Beirut, that's precisely the situation in which we find ourselves over the course of director and co-writer Ziad Doueiri's powerful 2017 Oscar nominated Best Foreign Film, The Insult which revolves around an insult between Lebanese Christian Tony (Adel Karam) and Palestinian refugee Yasser (Kamel El Basha) that quickly evolves from words to fists to an all-encompassing lawsuit. 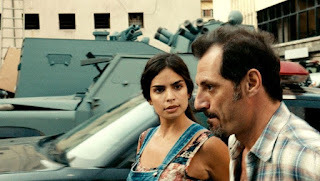 Using the power of cinematic point of view to great effect, The Insult first introduces us to Tony, a married mechanic and small business owner whom we immediately identify with simply because he was the first one onscreen. 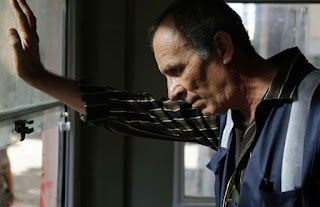 So devoted to his faith and the Christian Party that he keeps a photo of the president in the room of his unborn child (much to the chagrin of his expectant wife), we watch stunned when, upon refusing construction foreman Yasser’s polite request for access to fix the drainpipe off his balcony by instead telling them to use the street, Tony destroys their work without a word. After shouting out an obscenity at Tony, the proud, hard-working Yasser is reminded by his boss that since they’re in their (Christian) neighborhood, “you can’t talk to them like that,” and shortly thereafter, we learn that Tony has demanded an apology. However the attempt at reconciliation goes horribly wrong when Tony insults Yasser’s religion and people in a horrific way, causing Yasser to throw a punch which ricochets many times over that it leads to the legal case at the heart of the film. Quickly discovering that this is much bigger than he said/he said, both of the men (as well as their loved ones) are put under a public microscope that examines their pasts, prejudices, and how they got there today and predictably grow to realize that they might have more in common than they'd initially believed. As the two men's story begins to light up TV screens across Lebanon, the people of Beirut begin taking up the increasingly divisive fight, which winds up leading to the type of chaos and violence sadly all too familiar to viewers in Trump’s America where insults have become official presidential statements and hate crimes have been on the rise. 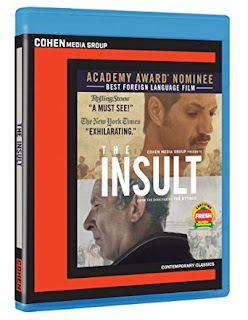 An extremely impressive work from Doueiri, The Insult would not only be a terrific selection to show high school students studying ethics but it's also sure to cause thrilling post-film discussion, including some from the filmmaker which is included as part of this technically stellar Cohen Media Group Blu-ray release.